Iperius Backup is a complete backup and recovery solution for Windows computers, servers and systems. The software is made by Enter Srl, an Italian company founded in 1997 that is engaged in management consulting, technology services and software development. Iperius Backup consists of several backup products for various Windows platforms, computers, servers, and other devices and hardware. It provides numerous solutions and features for personal, business and commercial users. The wide range of backup solutions gives the software unprecedented scalability to address varied and specific requirements of users, making it a powerful platform that unifies all backup tasks. Its features are built around high levels of execution agility as well as ease of configuration, allowing you to do different backup types on various devices, external drives, networked computers, FTP servers, and even to the cloud. Whatever backup task you need whether for your personal PC, business workstations, data servers or virtual machines, Imperius has the right and matching solution as it carries in several editions packed with features and functions for every kind and type of backup job. All editions, including the freeware, are provided with easy licensing and installation system available. There is only one installation file for all program editions and all Windows systems (including server systems) which can activate various licenses by entering a simple code. The backup software is a high-performance solution that is lightweight and portable and consumes very low resource while being extremely stable. It guarantees risk-free installation even on critical server systems and its flexibility makes it a handy utility for data transfer operations whether by individuals or companies. Iperius Backup is designed, created and supported by a company with many years of solid experience and expertise in software development, IT consulting, and backup and data protection. You get not only a quality product but also top-level support service. If you are interested in Iperius Backup it may also be a good idea to investigate other subcategories of Best Backup Software collected in our base of B2B software reviews. Enterprises have different needs and requirements and no software solution can be ideal in such a scenario. It is futile to try to find a perfect out-of-the-box software system that meets all your business wants. The intelligent thing to do would be to modify the system for your special wants, staff member skill levels, finances, and other factors. For these reasons, do not rush and pay for well-publicized popular systems. Though these may be widely used, they may not be the best fit for your specific requirements. Do your research, check out each short-listed system in detail, read a few Iperius Backup reviews, call the seller for explanations, and finally select the application that provides what you require. How Much Does Iperius Backup Cost? We realize that when you make a decision to buy Backup Software it’s important not only to see how experts evaluate it in their reviews, but also to find out if the real people and companies that buy it are actually satisfied with the product. That’s why we’ve created our behavior-based Customer Satisfaction Algorithm™ that gathers customer reviews, comments and Iperius Backup reviews across a wide range of social media sites. The data is then presented in an easy to digest form showing how many people had positive and negative experience with Iperius Backup. With that information at hand you should be equipped to make an informed buying decision that you won’t regret. 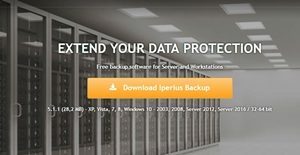 What are Iperius Backup pricing details? What integrations are available for Iperius Backup? If you need more information about Iperius Backup or you simply have a question let us know what you need and we’ll forward your request directly to the vendor.